This assessment is spot-on I'm afraid. The writing has been on the wall for some time with the advent of all these new, trendy burger joints: Lick's is on the way out. Meehan is siphoning off cash wherever she can, racking up the debt and will then pull the plug on the whole operation. The franchisees and creditors will be the losers. She's made sure she's taken care of. Capitalism at it's finest. 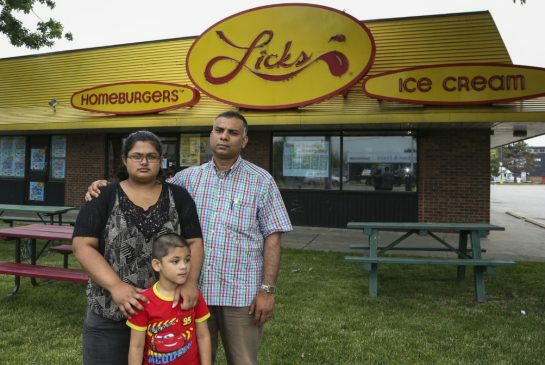 Marufa Ahmed recently went to open the Lick’s burger franchise she runs with her husband on The Queensway and was floored to discover the locks had been changed. Even though she’d been paying more than $11,000 in rent every month, there was a note on the door from the landlord. Lick’s head office owed them $88,130.53 in rent, so Ahmed had been evicted. “This is indescribable,” she said, still incensed more than two weeks later after having laid off her staff of 16. Ahmed’s experience is one of a spate of closures for Lick’s that’s fuelling speculation the venerable franchise — a GTA success story and pioneer of the current premium burger boom — is in decline. Denise Meehan, who founded Lick’s more than 30 years ago, said the situation has been “blown out of proportion,” even as the former franchisees cry foul after their restaurant was contentiously shuttered. She explained she had been in rent negotiations with the property landlord at Ahmed’s Queensway location. The landlord was threatening to evict the tenant “for months,” and ultimately did so when talks fell apart, Meehan said. When asked about the nearly $90,000 in arrears posted by the landlord, Meehan said that number was the subject of negotiations. “It backfired, and that happens in business sometimes,” she said, declining to go into detail about her spat with the landlord or about other “issues” she’s had with the franchisees because she’s anticipating a legal dispute. Another Lick’s outlet near Winston Churchill Blvd. and Highway 401 was also shut down by a landlord claiming outstanding rent, Meehan confirmed. Lick’s branches have also closed in Maple, Whitby and Hamilton. The flagship Beach outlet on Queen St. E., closed last October to make way for a condo, has yet to reopen elsewhere. The closures have occurred against the backdrop of a rush of high-grade hamburger joints in the city in recent years, while burger blogs and review sites have added to the fervour for quality beef in a bun. And in a restaurant marketplace with little overall growth, the path to survival means winning over hungry burger lovers from competing eateries. “What a hot phenomenon,” said Robert Carter, director of food service for the market research firm NPD Group . “At the end of the day, there’s only a certain pool of customers. The surge began after the 2008 financial collapse, when consumer eating habits started moving away from sit-down restaurants toward takeout, said Carter. This created a demand for innovative twists on fast-food staples, like burgers, as well as a desire for organic and seemingly healthy options. “When you take those trends and tie them together, you get things like the growth of the gourmet burger segment,” said Carter, who believes this has fuelled a level of competition that some older burger chains — like Lick’s, in his opinion — haven’t been able to handle. “Lick’s is caught in that stealing-shares game,” Carter said. Benjamin Allison, the web developer behind the Toronto burger joint review site Burger Derby , said he’s not surprised to see Lick’s locations closing their doors. “I think the market might be a little saturated,” said Allison, noting Lick’s is one of the GTA’s original premium burger joints, offering a higher quality spin on the fast-food experience. Correction - June 28, 2013: This article was edited from a previous version that mistated the location of the Lick's at 2969 Argentia Rd. as being near Winston Churchill and Hwy 427. Seems Ms Meeham withheld payments to landlord's expecting reductions in rent which didn't happen. If I were a lessee of the Lick's franchise, I'd sue for every penny lost as well as six to 12 months of lost revenue. Good riddance. Thank you Five Guys for putting them out of their misery. I wish the real In-N-Out could expand to Canada and kill off all those ripoffs like Burgers Priest. USA rules and Canada drools when it comes to restaurants and retailing. If the Franchisee was paying $11k a month in rent, how much could the HeadOffice be withholding? No one bothered to consider moving to a cheaper location?!?! You could have a place about 2/3 the size on St. Clair in mid-town Toronto for the $11k a month alone; how did this place even open to begin with ?!? So from what I understand the franchises were paying their full rent to Licks corporate but Licks wasn't paying the bills with it? Sound like a lawsuit to me. Rent must be paid, if the franchisee pays his rent to the Corporation, then the rent portion must be held in trust for the landlord if there is some sort of dispute> If Lick's collected it and spent it on other stuff, that is a simple crime of theft for which they should be charged. The poor tenants are completely blindsided when locks are changed and all they bought over the years is gone. I have seen cases like this where this has been a scheme to strip the franschiesse of their franchise so some crooked owners can then take over. Three for one ring any bells? Lick's used to be a bit of a fun place that I would take my kids to when they were young in the Beaches as they enjoyed the singsong stuff and liked the food. But damn the stuff was spicey and at the end of the day your bedsheets would be floating 2 feet above your bed. I knew that Lick's was coming to an end when the new Beach Condo's were going into that location and they started selling their "carp" in the Supermarkets. Who's buying that stuff? The VERY BEST burger EVER that I had in Toronto was at FuddRucker's on the Queensway by Sheridan Gardens. They had fresh meat and you could see the Beef hanging in the background in the cooler through the glass at the counter. All the fixings that you ever wanted at the buffet style counters after you got your burger so you could load your burger up however you wanted it. I was really sad to see FuddRucker's go away. I can however see Lick's go away real soon after they claim Bankruptcy.. It's not just an over-saturation on the market, this company fails to advertise and get the work out. To add to the problem, they're selling their Guk! and Licks hamburgers in local grocery stores. There's no draw to bring people into the restaurants. I suspect most of their customers eat there out of convenience (e.g. close to work for the lunch break). This news story isn't going to help any remaining franchises. If the info is accurate in this article then there are excellent grounds for a 'joint Franchisee' lawsuit. For HO not to have remitted rents on behalf of the franchisees is a breach of franchise agreement. Unfortunately it does not financially help the franchisee in the interim and will actually incur added costs until settled…but it sure sounds like the Franchisor has encountered financial difficultly and diverted funds from proper A/P channels to support something else that they owe BIGTIME! NOTHING TO DO WITH THE VIABILITY AND PROFITABILITY OF THE ONE LOCATION. Eww no, overly priced greasy burger with processed cheese. Their fries are good though. I tend to agree, Five Guys seems to be rapidly expanding, I'm seeing a new location every time I go for a drive almost.. But I don't find the food to be very good. Hamburgers are ultra greasy, and the menu is so boring and bland. Fries are above average for sure but they offer no toppings for them besides Ketchup. I hate ketchup! Licks used to be good, 30 years ago when it first opened and they actually made the burgers fresh on site. Back then you couldn't find a better burger. Now, they're tasteless, and tough and it's sad that they changed their 'guk' (which also used to be store-made) from using real mayonnaise to something that resembled Miracle Whip. Just not the same. Not surprised so many are closing. There are so many better burger restaurants out there. That is a very low and under-handed way in treating loyal franchisees. They could have at least come clean instead of ripping these hard working franchise owners off until the "last minute", leaving them high and dry. This meehan chick sounds like a real winner. Hang in there Marufa - maybe this is for the best. It doesn't sound like Lick's are very good people to be in business with anyway. Amen. Also, approx.90% of NEW restaurants eventually fail. There are just far too many restaurants, especially fast food & take-outs. Most family run neighbourhood restaurants succeed because the owners put in very long hours & build a loyal customer base. The owner also 'controls the till'. (most CASH purchases don't get rang in to avoid paying some income tax) while this can't be done at McDonalds type restaurants with many tills accessed by many employees. $10k a month in rent? how do they even break even?!? I've been to Lick's a few times. They always seemed like a dirtier version of something better. There's no way their offerings stand up to places like Burger's Priest, Works or The Burger Bar. They've found themselves caught between the two extremes of their market place and couldn't adapt fast enough. Shame about the franchisees getting screwed over though, they should have a lawyer review their agreement to see if there's any recourse. Anybody remember the original Licks? Where they grated the cheese onto your burger? And in the middle of summer you could walk down to the boardwalk and still have trouble sucking up your milkshake because it was sooo thick? No wonder they're having problems! The good old days! Thanks! Thornhill Lick's near me closed a few years ago now… always seemed quite empty 5 days a week, & probably too much overhead for such prime locations. Licks is history. I saw this years ago when I worked for a auction house in Toronto as the owner let things go and did not pay the bills. Remember one company that allowed the people there ran up there American Express card to over $250K. Once bankruptcy happened, all bills owned were not paid. As for this family I would look at there contact and see what it states. If the corporate office was to paid the rent, then that is grounds to go after them for rent paid plus lost of the business, income, etc. Best of luck to them. its a shame really i used to like licks burgers a lot but their quality went down and their prices went way up so i stopped going there about 7 years ago. ill stick to the independent guys like C n Dubbs for my burger fix. Licks burger patties are terrible .. that's why they are hurting. Their topping choices were always the best and most interesting.. just the burger is kind of the point. Not that some of these other "gourmet" burger places don't do the same… Hero burgers taste like frozen patties from the grocery store ..
Exactly… Sonny's Burgers at Queen & Kennedy is a "one of" Burger Pit success story in a crap area of Brampton that survives by giving good quality burgers at a reasonable price - something Lick's couldn't do with the corporate overhead. Actually Sonny's burgers are among the worst you will find anywhere, and believe me, I'm a loyal Sonny's customer myself. They use highly processed frozen patties sourced from Cardinal, same thing you'd find at Johnny's in Scarborough or Apache in Etobicoke. Sonny's poutine is awesome though! wow so this family ownership has bene paying their rent to the tune of $11,000/month to the Denise Meehan who in turn has been hoarding the money, possibly in a safe somewhere hidden from auditors so she can claim bankruptcy! ridiculous! This assessment is spot-on I'm afraid. The writing has been on the wall for some time with the advent of all these new, trendy burger joints: Lick's is on the way out. Meehan is siphoning off cash wherever she can, racking up the debt and will then pull the plug on the whole operation. The franchisees and creditors will be the losers. She's made sure she's taken care of. LOL. Go to licks website. They have a letter on there now addressing their ever loyal customers. No apology for the crappy service or quaity of food. Very conceided lady that owner. Been to Licks a few times, not too bad. I prefer "Hero Burger" and I like how Square One now has "South Street Burger." Horrific PR for Denise Meehan right now. Who ever is advising her should be fired immediately. Any financial issues should have been disclosed to the franchisees long ago. I do wonder if this violates the franchise agreement - this could get even more ugly quite quickly. It's rumored that there was a Lick's franchise location within driving distance to the location where Rob Ford's infamous CRACK VIDEO was taken. I think Hero Burgers has basically replaced Licks as the top local chain. Can't see Licks' situation getting better. Hero burgers are horrible. They will be start closing locations soon. The Works burgers are good but their menu is too complicated and their prices are too high. I predict a serious contraction for them also. Hero is on the bottom of my list - cardboard burgers - yuck! With Big Smoke and The Works, Licks was redundant. Why did they not open a new store when the one on Yonge St was closed to make way for Dundas Sq? They had a big market , but never made an effort to get back in the game. Licks abandoned the entire downtown core. I was impressed with Licks. They had representatives come to the Budget RentaCar outlet when it moved to the Canadian Tire lot and I was impressed. I see they played and got their franchisees dumped and not have any care to their wellbeing? Denise Meehan is a cold hearted monster. She played the big stakes corporate game and got burned bad. All without any notice to the franchisee. They don't get any earnings now the location is closed, she still does and shows absolutely no remorse of the actions of the corporation. I will NEVER buy Licks again. Always sorry to hear about people losing their jobs, but Licks' burgers weren't all that good anyway (way over-spiced) and that order counter musical comedy just turned me off. I went a few times: that was enough. Poorly written. Was the franchisee paying $11,000 in rent to the landlord or to Lick's head office in franchise fees? The article states the former but I suspect it meant the latter and then head office didn't pay the rent? "Another Lick’s outlet near Winston Churchill Blvd. and Highway 427" Winston Churchill Blvd. is nowhere near Hwy 427 - Did they mean 403 or 407? The rent should have gone directly to the landlord then this restaurants problem would not exists. They could get different suppliers and disconnect themselves from Licks problems. Then how would head office hide the profit they make off of the franchisee on rent? Bugs… You may be the bunny but I'm The Rabbit! Doesnt work that way in a lot of franchises. It's a sad story altogether. From my perspective, Lick's greatest failure is in its inability to adapt to a changing environment. It's "old-fashioned" model is one to which fewer and fewer burger customers can relate. By paying attention to the market, Lick's could have continued to prosper. Instead, they seem to have stood around and watched the world change around them. My deepest sympathies to all those caught in the crossfire. Maybe if their beef was fresh and not frozen, these franchises might still be open. It's hard to be successful when your product is inferior to the competition. Yes. Fresh beef. This would have caused head office to pay the rent. You are a genius. It is so sad to see hard working Canadians screwed by corporations and know their govt is not doing anything to protect them. This is not the first Franchise horror story and won't be the last. we need a new legal system to protect the innocent, then one we have does not. It was based on a society of innocents not the current one of wolves out to eat the innocent. While the others expanded and put themselves out there Lick's didn't. They became a smaller chain as the new guys became bigger chains. The result is I now have 4 different burger chains within a block of my office and no Lick's, I have another 3 on my way home from the office and again none of them is a Lick's. It is a shame really I like Lick's if I could buy one I probably would once a week but where a few years back I would go out of my way for a Lick's burger I can go to a half dozen other options now without having to make a special trip. Even if the corporate office manages the leases on the properties one would think they would have the decency to include a franchisee in any discussions. Sad when someone who takes your franchise fee treats you like a second class citizen if you ask me. While Licks had a decent burger patty, their buns were cold and soggy. They could have toasted the bun slightly and that would have made a world of difference. I haven't been to Licks in YEARS… as there are better burger places now. Denise Meehan "sometimes it happens"? So far it is sounding like she totally screwed the franchisees over. She buried their businesses without them having a say. I can't get over Meehan's "laaa dee daa" comment! It comes across as being so insenstive and uncaring of the brand that she built. Perhaps this is why Licks is yesterday's burger. So, where are the franchisees' rent payments going, if they're not going to the landlord? Or, has the landlord been charging a higher rent than the franchisees have been told they are required to pay? I haven't been there in a long while but I actually enjoyed the burger, I just couldn't stand the singing. It's a shame because Licks was somewhat of a Southern Ontario icon. One can only coast on brand for so long. Eventually a lack of quality and service will catch up. But it's no reason to lose sleep. Delicious burgs are practically falling from the skies above Toronto! As long as they keep making Natureburgers, I'm good. Best veggie burger on the market. You sign a lease and a franchisee agreement with the numbers in black and white. Most leases are locked in a 5 or 10 years, the only thing a landlord can increase is the CAM. Licks problem is quality of their food is below standard to what everyone else is doing now, the stores are dirty and old. Licks really did do this to themselves. Terrible management, terrible strategy, and overall terrible burgers. Been there a few times, years back now, and just couldnt seem to really enjoy it. There are way better options now like Five Guys, Hero Burgers, and Gourmet Burgers… Heck, even Boston's Pizza. Dont forget "the Works"… Its in a class of its own! Hero burgers were better when they were made fresh in store. Now that they use that central commissary it leaves something to be desired. Hero Burgers is horrible - cardboard burgers - burnt to a crisp every time I've been there. A&W seems to be expanding again. No the issue is the owners paid rent to Lick's and didn't forward it to the owners. Just seems like she pocketed the 11 grand a month. Have a nice weekend Denise! hahahahaha!!!!!!!!!!! karma! They are the pioneers of nothing. There are many burger places around older than Licks that where making a premium burger way before Meehan's joke. I will give her credit for th fun atmosphere her places had for a while. That was a good idea but in todays world its kind of stupid. They did it to themselves. The articles states it: "She explained she had been in rent negotiations with the property landlord at Ahmeds Queensway location." "It backfired, and that happens in business sometimes, she said". Of course the Star is always ready to write a sob story. Remember the guy who was sobbing about not getting the taxpayers to foot the bill to tear down his garage. You know, that little shack that was leaning against the million dollar house he just built. This approach from the Star is getting tired and annoying. You are hurting your credibility. Hankthecrank…"Of course the Star is always ready to write a sob story"…so why do you continue to read the Star and comment? I guess cuz the other papers charge? Sorry "other" Hank but bibi is correct. Lick's Corporate holds the leases on their units and then charges the franchisee rent. Very common and the same thing that Tim Horton does to their franchisees. Difference is that Horton's understands that you need to own those properties and not act as a middle man. HankTheRank. Read the article before you comment. The frachisees were paying rent to Lick head office of $11,000 per month, and the head office did not pay the landlord, without the franchisees knowledge. This is crearly a criminal act and I hope the police get involved. Shame on people like you for twisting the truch. Lick's probably was the pioneer of the premium burger movement but how can you grow a business without re-branding yourself at least a couple of times over 30 years to keep up? Lick's is the Al Bundy of burger joints…made a couple of nice plays 30 years ago, still thinks it matters. The stores are ridiculous in today's marketplace. This is sad to see, I was a fan of Lick's Burgers and it's a shame the franchisee's are getting shafted. It doesn't sound right to me. A little forensic exploration into the accounts at the head office of Lick's seems to be in order. One cannot remove people like that from their franchise without any previous communication…unethical business practices- I think so. I hope the family finds a good lawyer and a few other franchisees and they act as a group to "discuss" the actions from the "top brass." Well there's always the grocery store. I often purchase the box of 4 burgers and bbq them myself. Everything they put on it can be purchased elsewhere. The woman who owns the rites to the product isn't going to go broke any time soon. While I feel for the owners, Licks began to go way downhill the moment they got into franchising. It was never the same after that and I blame Denise Meehan! The decline in customers is happening all around, not just at Licks. When the cost of living increases and wages don't, people start reducing or cutting out restaurants and entertainment purchases. The franchises that offer specials (e.g. Subway's discounted menu items) will do a lot better attracting customers than restaurants like Licks that don't advertise or have special discounted items. Throw in bad management decisions like not paying rent and the writing is on the wall for this company and any others that operate in a similar fashion. Being 'in business' is no excuse for shabby treatment of people. This happens in a 'FAILING business, not in a successful one. Franchises have always been considered the wild-wild west of business. How many times have we seen more than one of the same franchise on the same block. Just had a friend lose his $350K cash investment in a breakfast franchise, then he had to claim bankcruptcy. Lick's franchisees are not just competing against other premium burger restaurants, they are competing against Lick's head office. Customers can buy boxes of Lick's burgers, various flavors, at grocery chains like Fortimos at a fraction of the cost for a backyard BBQ rather than taking the family out or hanging out with friends at a Lick's restaurant. Does Lick's even need to franchise any more except to advertise the brand-whcih the franchisee is paying for? Pretty good gig for Lick's, they are having their burger and eating it too. Years ago, maybe late 1980s, I visited the Licks franchise once located at Yonge and Eglinton. I had always liked the burgers served in its original outlet.. Licks had this corny routine in which employees would ask for a customer's order and name and then proceed to sing a song containing that name. I was tired and very hungry and just wanted to eat. I declined to participate and was gently mocked for my apparent failure to play their silly game.The burgers were also not as good as in the past. This was an awful marketing idea. I never went to any Licks again. I feel for the franchisees but not Licks' founder. Like many great original ideas, this company became the victim of expansion greed. Quality was sacrificed in the name of profit. I understand that I don't like all the same things that others do but YES that routine did keep me away. I failed to mention that what also kept me away was a TV interview of the founder. Hahahahahaha! Licks! Worked there for a time. Conceided upper management with no care for anybody else. One person there once said "there will always be poor people". Hopefully they will be in the poor house now. Too bad though, Licks burgers are pretty good eating but there are better places to go to now. As a customer I have tried to contact Licks management to give candid feedback on the store I frequent - the only contact info I had was an 'interested in franchising' email address, who never thought it worthwhile to respond. This (article) is no surprise - if Licks as a company refuses to take ANY responsibility for their franchises or the customer experiences those franchises deliver, this spiral of failure will continue to proliferate. I tried the same with Hero Burgers, e-mail, fax, and postal mail … no response. I don't go back to Hero Burgers anymore. Classic failing business story. Don't pay your bills. Steal as much as you can from your people and suppliers. Put it in your pocket. Then run away before the house of cards collapses. And get away with it because our legal system is so convoluted, slow, and expensive. The only people that win from a lawsuit are the lawyers billing hundreds/thousands per hour. Time to move on Marufa. Let your lawyer worry about the law suit. Apache Burger…now craving a burger at 9:30 a.m.!!! Five Guys is a franchise and I would pick them over a Licks burger any day. Then again changing the actual burger would be a risky move. Apache Burger???? Really??? Apache is "NOT PREMIUM". I like their burgers, but they're not in the premium category… the meat is not premium, the fries are soggy, onion rings are tasteless, and the dill pickles will kill the burger with the amount of vinegar they're swimming it. I'd take Licks over Apache any day. Hey Inner…that's my point. Lick's would be ashamed to be compared to Apache but try Apache right after a visit to any Lick's. Compare the experience. Lick's is no premium burger joint either! Licks was the victim of their own success. When they were a small company with only one or two downtown locations, their burgers were a real treat. They were better than anything you could get anywhere else and the whole environment at their restaurants was all about fun. The order takers and cooks used to be signing cadence like-songs as they took and prepared orders. When they expanded, the lost that touch and became more like McDonalds. Their food quality suffered and so did the overall environment of the restaurants. I think you're spot on about McDonalds. They're selling really good coffee now. And really, that's enough to put them above practically all fast food joints. Coffee is almost all profit. As for Hero Burger, I think they are here to stay, as long as they don't get too jaded and inflate their prices, or substituting for inferior quality ingredients. Right now they're like the median burger joint, in both quality and price. I still miss Toby's. It seems all these type places have a shelf life. We used to frequent the one in Thornhill, but it went downhill and closed several years ago. Friends and I used to frequent the Tobys on Yonge just north of Eglinton. The grill was placed close to the front door and the aroma of its delicious burgers would drift down the street. I used to order an over sized burger called "Fat City". Tobys made a wonderful salad with big chunks of cheese and an amazing dressing. Unfortunately, It too became the victim of franchising, menu diversification and dilution of quality. I found the older Licks stores run down and not maintained. Was a fan of their Beaches store but for an upscale burger joint the skimped on condiments. “It backfired, and that happens in business sometimes,” Translation, Denise thought it would be a good idea to stop paying her corporate portion of the rent and rack up a huge bill with the landlords. Once that bill hit critical mass, she then thought it was another brilliant idea to renogitiate payment of the outstanding balance, at a substiantially reduced rate (probably only wanted to pay 1/4 or 1/3) at which point she told the landlord to "take it or i'll just shutdown and move elsewhere". The landlord immediately saw this as a permanent reduction in rent (not a 1-time deal), well below what he could get from other tenants, so he said "No". I hope the landlords sue her for damages and interest and court costs. Denise is nuts. This scenario of business tenants holding commercial landlords hostage for rent is more common than you think. It is a poker game where the tenant does not think the landlord will call their bluff, counting on the notion that they could not recover rent income from someone else. In this case, the landlord is either well capitalized to absorb a temporary deadbeat tenant or has someone else waiting to sign a lease at the location. A move like this from Lick's or any other business are signs that trouble exists far beyond "restructuring". I was surprised that the franchisee was unaware of problems with the landlord since they were paying the head-office their rent every month. If they were successful in reducing the rent, head office was probably going to keep any savings without passing any of it to the franchisee. Considering this story happened in multiple licks locations that i know of, you are probably 100% correct. There had to be some warning signs somewhere. Strange one but sad for the store operators. Yes, there were: I noticed a change in the burgers, and a switch in the ambiance. Remember that they used to have the people working there sing out these little tunes? That stopped a little while ago. There were other small changes that individually, didn't seem like much, but put together, make the place seem like just another burger joint. Can't happen to a more deserving brand. I feel for Lick's franchisees. They deserve better. Full disclosure: We had a terrible experience at a Lick's here in a GTA area and haven't been back since. I asked for a minor change to a marketing promotion for a 9 year old and was rebuffed. Our family of 4 left and haven't been back since. The actual franchisee refused us. I'm sorry he's not being closed down. Oh, and yes, the neighbourhood kids never get their ball back when it lands in my backyard. And yes, I sit on my front porch and yell at people to get off my lawn. Thanks for letting me rant. I'll get back to accepting everything around me as they are and should be. Lunch for three can cost you close to $50 and the burgers are smaller, the toppings not as bountiful and you get a little smattering of cheese. Add to that a staff that is apathetic and Licks is a shadow of itself. The one in Oakville at Bronte and Lakeshore also closed over a month ago, also as the notice posted said for lack of rent payment. I wish the Denningers would expand into the Licks space, the Oakville Denningers is the tiniest size imaginable, not sure why that is with all the spending money here we have the worst retail in the GTA. Agreed. Getting a permit south of the 403 in Oakville to do anything with food is crazy to do though. Nimby capital of Ontario. I remember visiting that location, & recall how unfriendly those two were when I presented a discount coupon, as though they were doing me a great favor to accept it. Never went back. Had a worse experience at the Eglinton/Warden store. No sympathy here. I'm not defending their actions - but empathizing with them. often these coupons are put out by the head office without consulting the franchisees. this is money taken directly out of their pocket - essentially without their consent - resulting in sometimes selling stuff at cost. Classic boo-hoo T Star story. I've never heard of a head office paying rent for a franchisee. These are the risks of entrepreneurship. This type of lease arrangement is very common. Its called a 'head lease' that the franchisor holds and then creates a sub-lease for the franchisee. do a google search next time before posting people. Crazypills, is the franchise business you have been involved in still existing? The head office (franchisor) ALWAYS pays for rent for the franchisee to prevent the franchisee from taking over the specific location of the franchised business and open its own business on the same location once the franchise contract is over. In other words, the lease agreement is only between a landlord and a franchisor (head office). A franchisee has no say whatsoever on the lease agreement. The franchisee is only allowed to operate the franchised business in the specific location during the term of the franchise contract. Once the term of the franchise contract is over, if franchisee does not renew the franchise contract with the franchisor (head office), the specific location will be given to new franchisee. Always? I have been involved in franchise agreements before and i assure you that it is not always done. It does make sense when head office wants to lock in the location. But they did, and obviously the franchisees didn't understand that. It is a strange arrangement though: I think purpose of a franchise arrangement is for the chain to establish the market and the franchise to execute. Things like pay, rent etc are up to the franchisee to handle (and to take the risk)..